Aren’t we lucky to have it all! Women. We are lucky, aren’t we? Those of us who find ourselves at our prime in this post-feminist era really do have it all. Our sisters at the turn of last century fought for suffrage giving us an equal right to vote. A few brave pioneers challenged universities (and often their own fathers) for our right to be educated, and now there are more young female students than there are men. 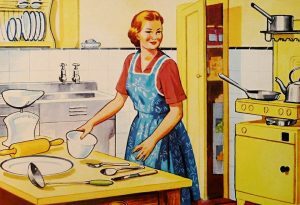 The new washing machines, vacuum cleaners, fridges and freezers of the 1950s freed women from the endless round of hand-washing the laundry, hand-beating carpets, and spending the rest of the day shopping, cooking and washing dishes. The advent of the pill in the 1960s gave us sexual freedom, and the freedom to decide when to have children, and – more importantly – when to stop having them. The equal pay act of the 1970s gave us – on paper at least – the right to be paid the same amount as men doing an equivalent job. And now we have it all. But boy, it is hard. Because although it is all there on paper, real equality and choice still eludes most women. The official figures for the Scottish Government show that the pay gap in median hourly earnings (excluding overtime) between men and women working full-time in Scotland was 6.6%. That doesn’t take into account that more women than men work only part-time to fit in with childcare hours. The impact on their promotion prospects and pensions in later life is considerable, yet in over 90% of cases it’s still the woman who takes the career break for children. Women may be doctors and lawyers, architects and dentists at work, but we still shoulder the lion’s share of domestic and household tasks. As the ones more likely to be rushing from work to pick up the kids, we are overlooked for promotion in favour of our golf-playing, beer-drinking male colleagues. All of this is generalisation, but generally true. It will take a lot of unpicking to make better, requiring a cultural shift in attitude that stops dividing the world’s tasks into ‘men’s work’ and ‘women’s work’ and looks more towards partnership at home and equality of opportunity in the workplace. I know – you don’t need to tell me, I am in a privileged position. I am white, married and educated, and I have a good (self-employed) job and a husband who also earns well. But that doesn’t stop me sometimes feeling overwhelmed by the pressure to be everything to everyone – to work hard to meet my clients’ expectations, to keep a clean house and enough food in the fridge to be able to rustle up a delicious dinner, to hit the gym three times a week to keep myself fit and healthy, and to still find time to see my daughters and family, see my friends and – occasionally – relax into the sofa with a glass of wine. I can’t remember the last time I did that last one, and until we all caught up last weekend, I could barely remember what my friends looked like. Three of us cooked Sunday lunch for 12, and as we peeled and chopped and stirred and tasted, we wondered how we would have fared as 1950s housewives – preferably in an Italian village – where our only role was to keep house for our families. 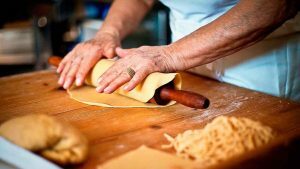 Cooking would be a delicious, communal exercise, with our friends and our sisters, and we’d pass down the recipes we had learned at the knees of our Nonnas. Sure, life might not have been fulfilling in the same ways as our professional careers are now, but we’d have been doing everything that was required of us, our stresses would be less, and there would be the camaraderie of sisterhood. This post first appeared in Seven Days, published by SPP and issued with The Inverness Courier, The Northern Scot and four other titles across the north of Scotland, week ended 23rd November 2018.